The point is, I woke up this morning and realized I'm about to get married to a wedding singer? I am never gonna leave Richfield! Why do you need to leave Richfield? We grew up here. All our friends are here; it's the perfect place to raise a family. Oh, yeah - sure! Living in your sister's basement with five kids while you're off every weekends doing wedding gigs at a whoppin' sixty bucks a pop? Once again, things that could've been brought to my attention YESTERDAY! Definitely in my Top 3 list of Adam Sandler movies. The Wedding Singer, contrary to its rom com synopsis, was a really smart comedy. Great cast (Steve Buscemi! ), non-bubble gum-y soundtrack (The Smiths, Elvis Costello, Psychedelic Furs) and a cameo from Billy Idol. Speaking of weddings (segue! ), this past week I completed my first baking order: 170 monogrammed cookie wedding favors. My freehand piping is still a bit shaky and since these were going to be given to the guests, I didn't trust myself to chance it, even with a lot of practice. So I went the kindergarten route. I traced them. Want to try these out? I'll try to make this tutorial as concise but thorough as possible, oxymoronically speaking. If you have any questions, electronic mail me. First, the monograms. You can make these the night before you make the cookies. Pick a font you like, type out the letter you're using (try to fit as many as you can on one sheet) and print it out. Tape a piece of parchment paper onto a square cakeboard or a piece of cardboard. Tape only the top and bottom so that the sides are left open. Slide the sheet of printed letters underneath the parchment paper. Prepare a batch of royal icing. Pour it into a piping bag or bottle and fit it with a tip (I used Wilton #2.) Trace over each letter with the icing. Let them dry for a few hours or overnight. If you transfer them to a container after drying, be gentle with the little guys. I ended up with a few "F"s.
Make your sugar cookies. I wanted a softer, more rounded cookie so I used this recipe for Bavarian-esque sugar cookies. Once your cookies have had a chance to cool down, it's time to revisit the ol' Dam and Flood technique that I love so much. 3. Place the monogram on the cookie while the flood is still wet. You can make it all cutesy and pipe dots along the edge once the flood has dried a bit. Since these were being given as favors, I bagged each one individually. You can even up the cuteness factor and tie on some coordinating ribbon. If you're going to try these out, I suggest starting with a smaller number (something less than, say, 170) to get a feel for it. If you "accidentally" mess up on a cookie, promptly get rid of the evidence. Have a great weekend, party people. Take off my Van Halen shirt before you jinx the band and they break up. Somewhere in a box, in a storage unit, is the soundtrack to the movie along with a tiny micro card adapter I was looking for this past weekend. Congrats on your first baking job!! Wut, wut!! They look yum. Ali, these cookies are gorgeous. I have no decorating skills whatsoever and am completely in awe of those who do. Margie - that's the best quote in the movie, right after Linda tries to wake him up before he go-gos. Great job, Ali! So cool that you got this chance to do something like that. I'm so excited for you and Mike for all the awesome things that are happening to you guys lately. Yeah, go ahead. have a few drinks and, you know, drive home. 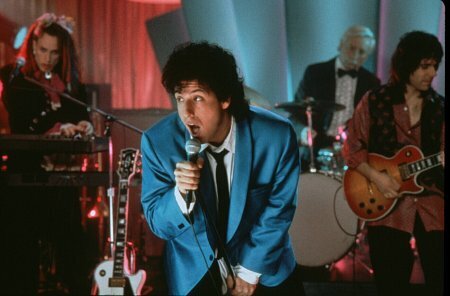 Wedding Singer is top 3 of all time for me! That's a lot of Es! You should make mitsubishi cookies for the next batch. Christa Rose - thanks! I like that name even better than Tiffany blue, probably because I have a fondness for M-Stew. Liam - thanks for the encouragement :) I'm especially excited for Mike. I foresee many Happy Hours in the future. Bryan - Top 3...that's a bold statement. I'm guessing the other two are westerns. The production line you and your sister had going for these amazed me. Your dot placement skills are precise and FAST. The Wedding Singer is so good! Your cookies look awesome! I envy anyone who can make pretty cookies. Rick - you could probably fit a small travel file in these for Lilo. Wedding Singer..i love it too..Nice cookies CONGRATS!